The day in Aughoose began comparatively peacefully. In the early afternoon a group went for a walk along the pipeline route and observed the aftermath of yesterday's wholesale carnage. There was a heavy Garda presence, with four vehicles patrolling the area and twenty Gardaí observing the group. At around 3pm Shell surveyors were noticed on the shallow waters of the estuary. Two kayaks and six people in total went out to greet the four workers on the vessel labeled “safety boat”. It was one of the same boats, operated by Belcross Enterprises, that rammed a kayak last Sunday when activists attempted to block the laying of the umbilical from Glengad beach to the gas field. 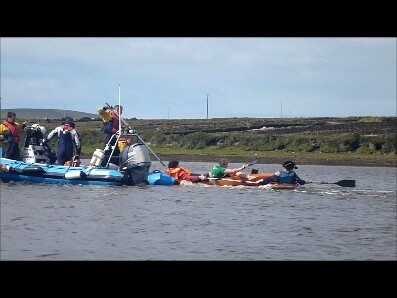 Eventually the activists reached their target and held on to the side of the boat. 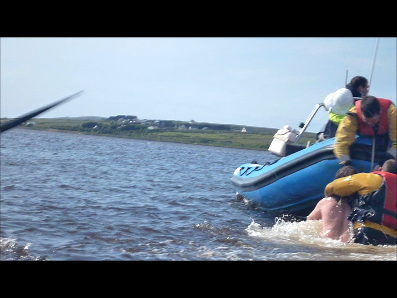 The engine was turned off for a few minutes but they eventually restarted and took off at speed, dragging the kayakers and one other person along with them. One worker asked the driver to turn off the engine as an activist was near the propeller but he refused. The kayakers were removed when the workers bent back their fingers and eventually shoved one of them in the back with a pole. Shell workers in the boat told the protesters that they were putting them in danger by being there, and not letting them drive in a straight line, and that it was an "act of piracy" to touch their boat. 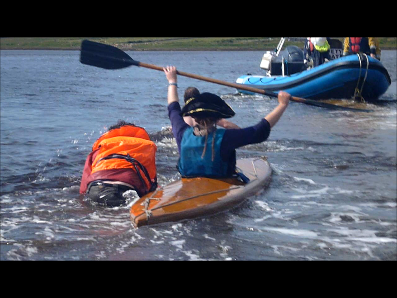 The kayakers continued pursuit but the boat was too fast. One activist with no kayak remained holding on to the side of the boat as it sped up the estuary. A worker jumped out of the boat and attempted to remove the protestor by strangling him, while another in the boat held on to his hair and attempted to push him under water. 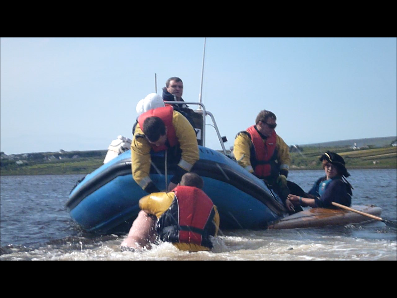 They eventually forced him off the boat and drove down the estuary, leaving their co-worker temporarily stranded. Acts of resistance such as this will continue throughout the week in protest against the dangerous and divisive gas project.